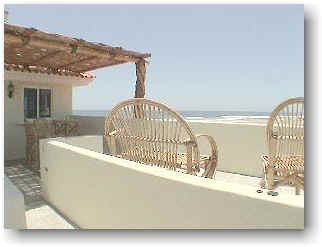 The beachfront 1BR Pescadero Palace Penthouse has the Pacific Ocean as its front yard and sits on the 3-mile white sand beach of Playa San Pedritos, one of the best surf breaks in Baja California. 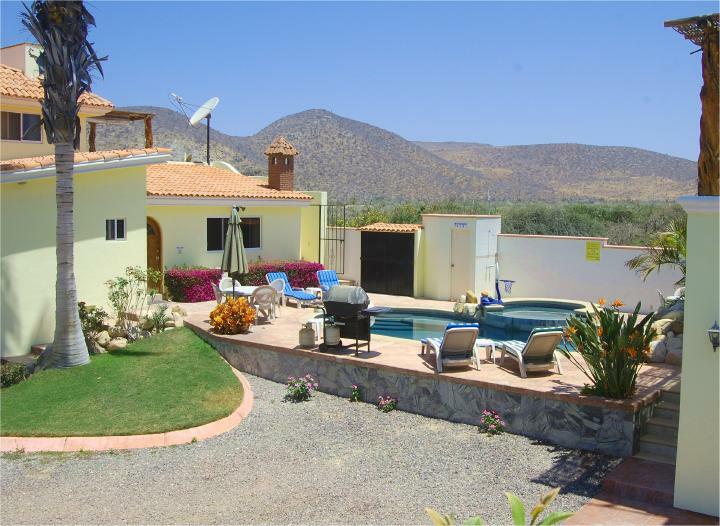 It has an excellent location 5 minutes South of the charming town of Todos Santos and 45 minutes North of downtown Cabo San Lucas. The Penthouse has its own private gated entrance, and 2 terraces with spectacular ocean and surf views, making it the perfect romantic getaway. Amenities include a beautiful heated swimming pool, Jacuzzi hot tub, satellite TV, computer with highspeed internet connection, washer and dryer, A/C, full kitchen with all appliances and utensils, and maid service available. Beds include a Cal King and fold out sleeper. 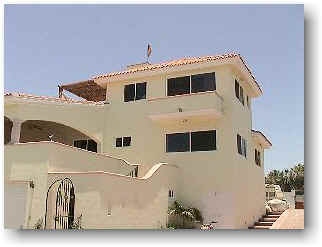 The entire property is walled for security, with a remote controlled entrance gate. For beachfront luxury and comfort, this Penthouse can’t be beat! The beachfront Pescadero Palace Penthouse has 2 private terraces and spectacular ocean views. The interior is beautifully furnished with a Cal King Bed, computer, satellite TV, and full kitchen. 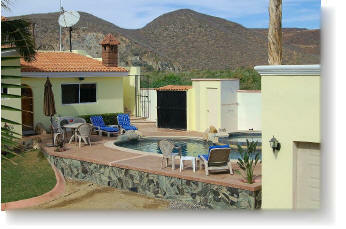 There is a private gated entrance that goes from the heated swimming pool and Jacuzzi hot tub up to the Penthouse. There is a private sunning area, and outside dining area. 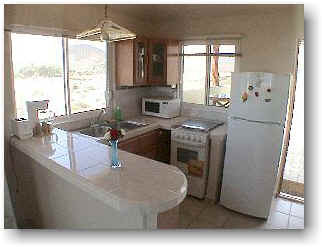 The kitchen is fully furnished with all appliances and utensils. 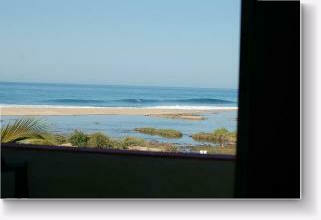 The bedroom and front terrace have spectacular unobstructed ocean views of the surf and Pacific Ocean. 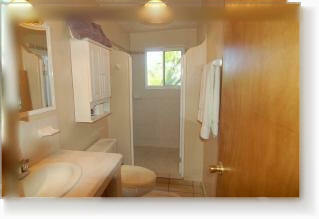 The private bathroom is clean and beautifully tiled! The private gated entrance from the pool and Jacuzzi patio! This is the view from inside the Penthouse Condo! The private terrace is great for sun bathing and lounging! 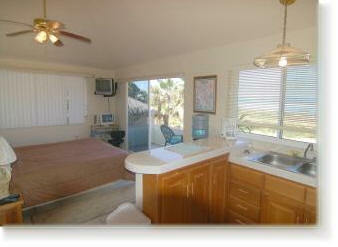 The bedroom is large and spacious, and has a king size bed!